“There was a hand in the darkness, and it held a knife.” A mysterious man has murdered the toddler’s mother, father, and sister, and now the man mounts the narrow stairs, up to the nursery-attic, to finish the most important job of his existence. But the baby is gone. The curious tot finds himself in the nearby cemetery, under the protection of the shadowy Owenses and Silas, an even taller, darker, and more mysterious stranger than the first. Mr. and Mrs. Owens, who in life were childless, fight to keep the baby after his newly deceased parents appear and plead with them to keep him safe. The boy’s story is certainly a strange one. First of all, there’s his home, the graveyard. He is given free rein in the graveyard to explore as he wishes. The names and epitaphs engraved on headstones make for an odd topography of childhood, but the ghosts the graves contain are the child’s only friends for much of his childhood. Then there’s his name, Nobody (Bod for short); when the other ghosts in the graveyard bicker over his resemblance to past acquaintances, Mrs. Owens insists that “he looks like nobody but himself.” Silas agrees, and Nobody is his name. Which brings me to Silas. Silas is an unexpected guardian, to say the least. Like Bod, he also has full access to the graveyard, but unlike his young charge he only comes out at night and he does not dwell among the ghosts for long, swooping off into the night like a bat. Each chapter is a story that could stand on its own, but in the end, everything Bod has learned in his unusual life comes in handy. He meets the Indigo Man and the Sleer in their ancient barrow, and he travels through a gate to the home of the ghouls, Ghûlheim. He befriends a witch on the outskirts of the graveyard, and he learns about the forgotten ritual between the living and the dead, the danse macabre. He attends a school outside the graveyard when his ghostly tutors falter in their knowledge, and, perhaps the scariest part of all, he meets a young girl whose curiosity mirrors his own. Neil Gaiman is one of the best storytellers I’ve ever encountered. From the very beginning, The Graveyard Book is an irresistible story. Gaiman carefully balances the intrigue of a triple murder with the fresh innocence of a child like any other, learning about the world with wide eyes and a million questions. Even from the path below Ghûlheim, even from miles away, Bod could see that all of the angles were wrong—that the walls sloped crazily, that it was every nightmare that he had ever endured made into a place, like a huge mouth of jutting teeth. It was a city that had been built just to be abandoned, in which all the fears and madnesses and revulsions of the creatures who built it were made into stone. The ghoul-folk had found it and delighted in it and called it home. To see such serious talent beside a thoroughly engaging storyline is rare and refreshing for any book, much less a children’s book. Silas also has a way of turning murder and death into a reason for living in words that avoid sounding trite or overworked. 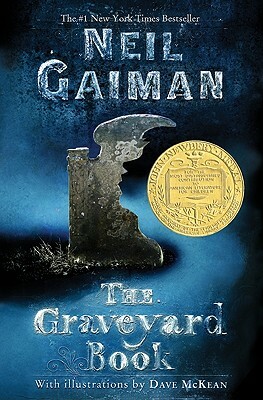 The Graveyard Book was truly a delight to read, and I appreciated Gaiman’s intelligent handling of complex issues without losing sight of his inventive narrative. I would recommend this book to almost anyone for its fully formed characters, excellent prose, and engaging plot. Have you tried listening to the audio of this book? It’s narrated by Gaiman and it’s simply breathtaking! Oh, yes, I’ve heard great things about it. I’ll be sure to do that!